One of my newest favorite blogs, Skinny Runner, has a great feature on her site called Celebricizing, where she posts photos of celebs working out. I’m mildly totally obsessed with it. Maybe it’s motivating? Maybe it’s disturbing? A little from column A and a little from column B? Either way, I’m hopping on the celeb-loving bandwagon and starting my own feature called Celebradogs. Because what’s not to love about celebs who love their dogs? My personal favorite Celebradog, other than Teton of course, is Amanda Seyfried’s dog Finn. I swear I haven’t seen a paparazzi shot of this chick without her dog in over a year. And I see a lot of razzi shots. 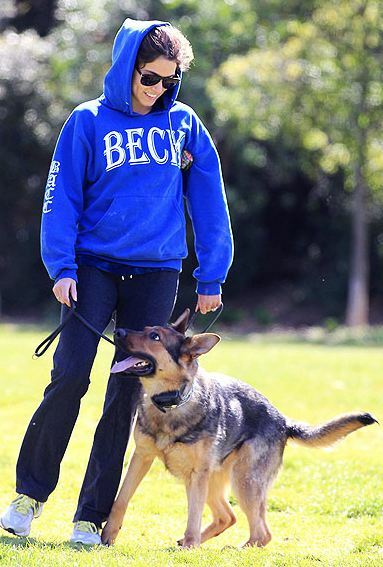 Here’s Twilight’s Nikki Reed and her new rescue puppy, Enzo. I’d say they both look pretty happy to have found each other. Gossip Girl’s Blake Lively and her favorite accessory, dog Penny. Jessica Biel and her Pit Bull Terrier Tina workin’ it on a walk. I can’t not include Jennifer Aniston and her adorable little dude, Norman, who died last May. Jenn loved Norman so much she had his name tattooed on her foot after he passed away. Ladies, here are some hunky men and their Celebradogs just for you. Mad Men’s Jon Hamm gets props for picking up after his adorable pooch Cora. Ryan Reynolds’ dog’s name is Baxter. He’s been quoted as saying that he “just fell in love with him,” when he first saw him at a Houston animal shelter in 2009. 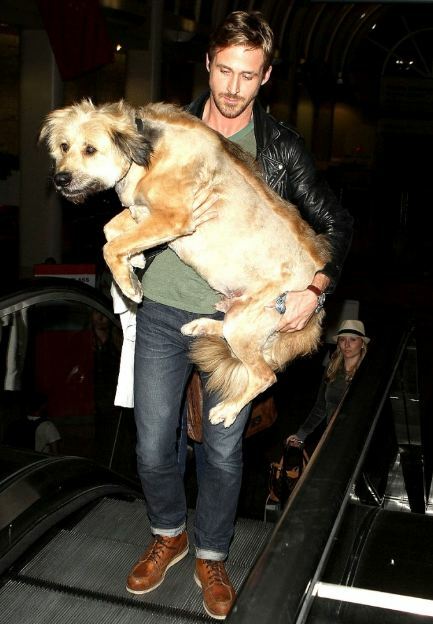 Last, but certainly not least, the always hunky Ryan Gosling carrying dog George up an escalator at LAX. Too sweet. 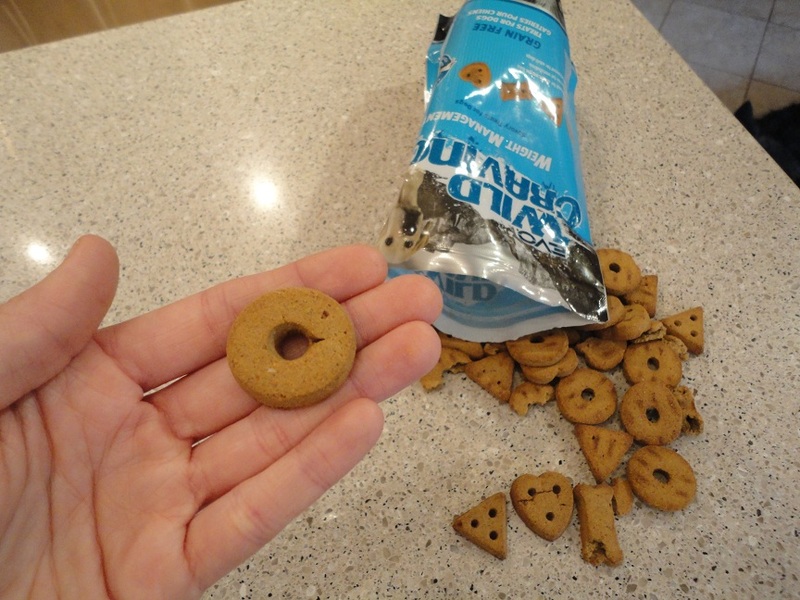 One of the items that I received from Mr. Chewy last week was Evo Wild Craving’s Weight Management Treats. This grain-free treat boasts a hearty ingredient list that includes things like turkey, apples, carrots, peas, and pumpkin (among others). They are high in protein and low in carbs, which makes them a great treat for a pupper that’s trying to stay slim. What I gather from Teton is that these treats are nothing like SnackWells. 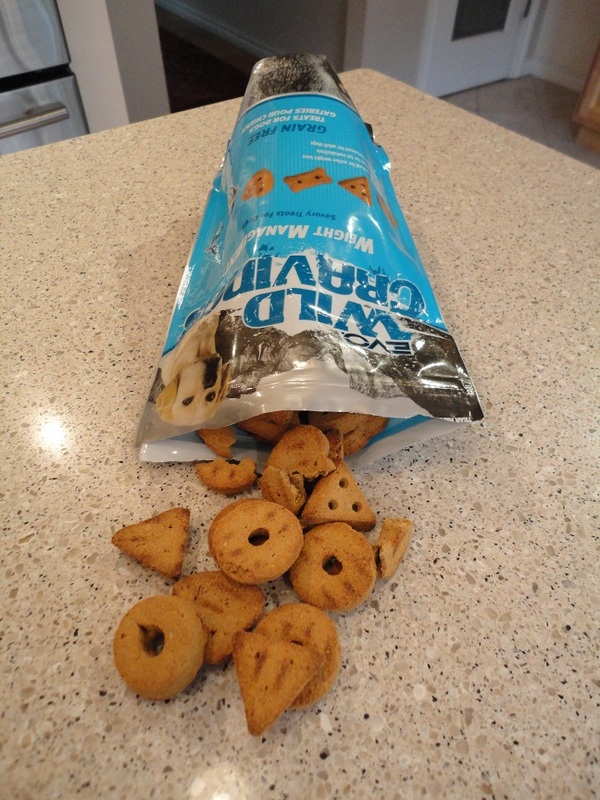 Because, lets be honest, if you’ve ever uttered the phrase, “These SnackWell cookies are great! They taste just like devil’s food cake!” you were lying. 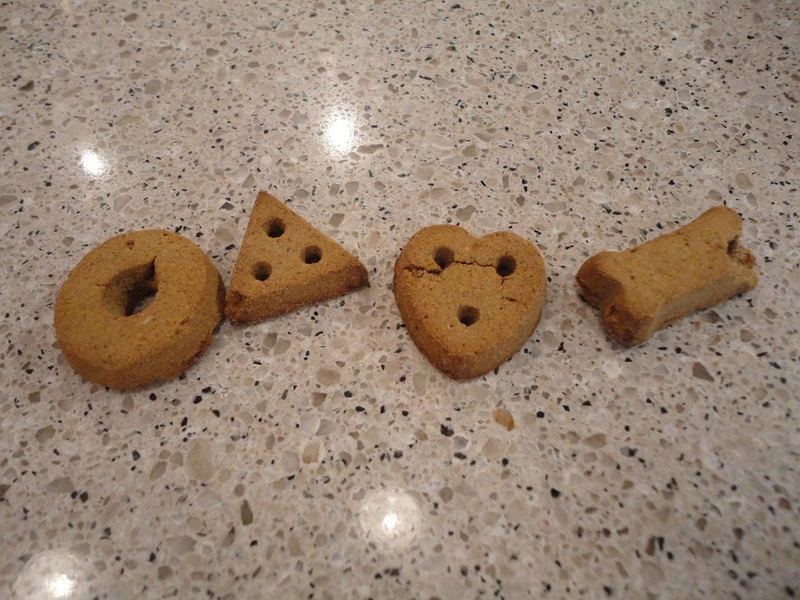 I like knowing that these treats, which come in four different adorable shapes, have less calories than most of the other dog treats in our cupboard but still taste great to Teton. I imagine, from the sound of his chewing when I give him an Evo Wild Craving treat, that these have that melt-in-your-mouth quality, which sets them apart from most other hard treats. So, they’ll likely be a good option if you are looking for something that’s softer for an older dog or one with sensitive teeth. Know what else rocks? A 10 oz bag of Evo Wild Cravings Weight Management Treats is just $4.99! Boom. That’s a good deal. To enter Her Dog Blog’s first ever giveaway, all you have to do is leave a comment telling me who your favorite Celebradog is. Feel free to Google your little hearts out and find new Celebradogs that I didn’t feature on today’s blog. I’ll randomly select a winner next Tuesday. Good luck! Posted on March 8, 2012 by Shannon	This entry was posted in Treat Jar, Web. Bookmark the permalink. umm, john hamm needs a poo sheath. just sayin’…. my favorite celebridogs are chuck & coco from dooce.com … mostly because coco is a mini aussie like fossie and because chuck is too handsome for words. We love President Obama’s dog, Bo. Having a Portie ourselves makes us a little partial to the breed. I’d have to go with Queen Elizabeth’s dogs, mainly because I own a Corgi too. I loved the first one with Amanda & Finn. I feel the same way, I have to rush home from our evening plans to feed/potty and play with my sweet puppies mia & lucy! That’s when you know they love each other, their bond is so tight that they can’t bear to be away from each other.